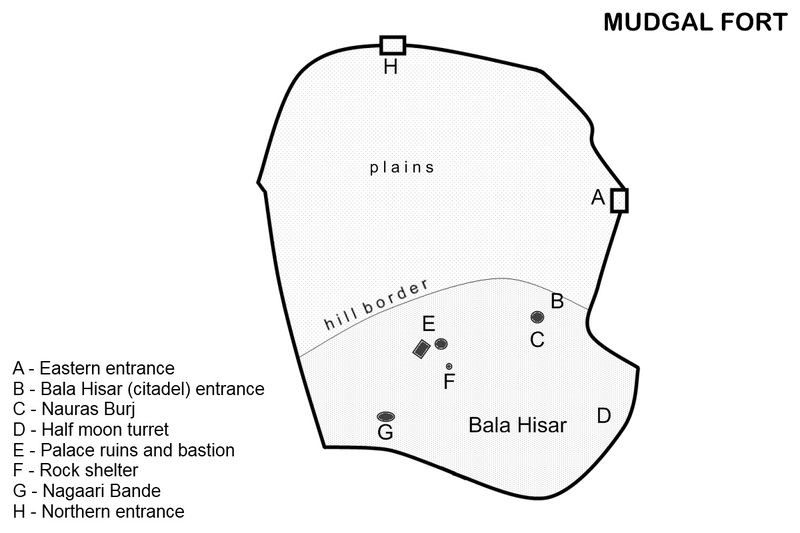 My first visit to Mudgal fort. 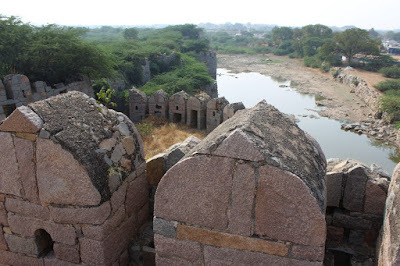 Starting from the eastern gate, we spent close to 4 hours exploring the formidable fort. The fort is built on a rocky hillock and the neighbouring plains. 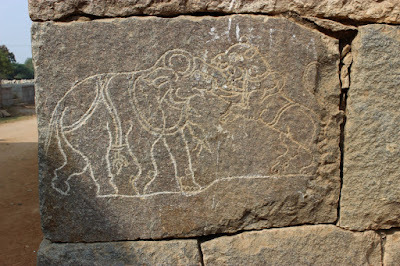 The rock hill itself is a prehistoric site; we discovered a natural rock shelter with a small painting and musical stones. 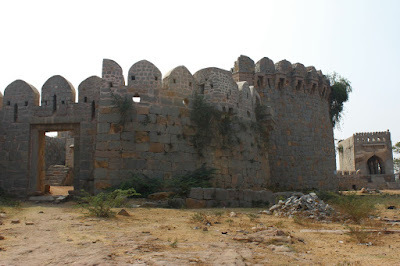 The fort was originally built by Hindu rulers and later occupied by Muslim rulers. Having spent hours under the blazing sun and heat radiating rocks, we were exhausted. We just wanted a shady place, sit and have lunch in peace. We lunched our guides. 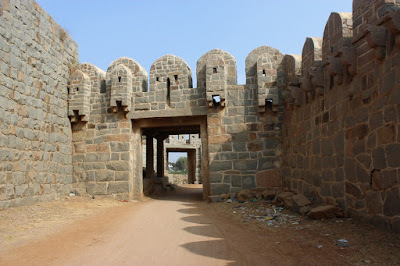 They suggested us we check out the northern gate as well but we were in a rush to reach Jaladurga..
One of the routes connecting Hyderabad and Dharwad passes through Mudgal. For today's drive, we'd taken this road and stopped by Mudgal fort's northern gate. Sun was blazing down fiercely (definitely hotter than Dec 26 2015). Pushpa decided to sit in the car; I ventured out with my camera. The North gate itself has two entrances- one facing east and other facing west. The gateway is complex, has a zig-zag path to slow down enemy entry. Here's the smaller east facing gate. 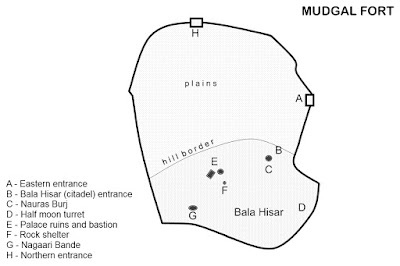 Map of Mudgal fort showing Eastern and Northern gates. 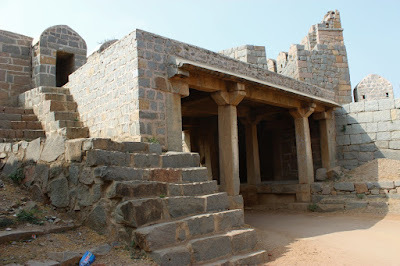 View of the inner gateway trough the eastern door. In through the gateway and turn right to see north door. Thsi gate is called as Fateh Darwaza. This stairway next to the inner gateway takes us to a turret. A damages cannon sits atop. 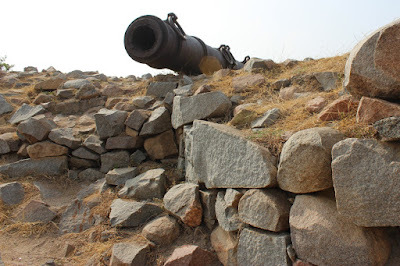 This was the cannon our guide Shah Rukh wanted us to see. Here's the broken remains of a cannon which probably was 18 feet long originally. 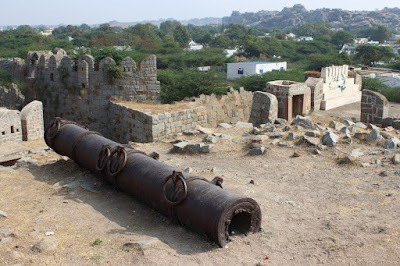 I remember seeing a similar cannons at Raichur fort summit but that's in pretty good shape. Originally a moat surrounded the perimeter on plain land. Even to this eastern part of the moat has water. View of the moat from the northern gateway. 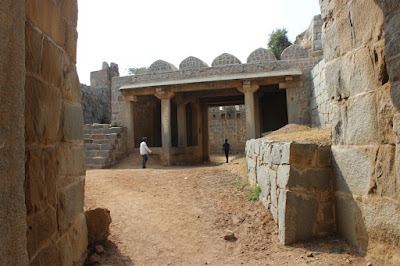 Another view of the inner gateway. Close to the northern door on the wall is this engraving- lion leaping at an elephant. These walls are close to 800 years old and standing to this day. Cheers to the engineers, stone dressers and masons of that period.